Course Information Located near Narita International Airport, and it is recommended for those who are ataying at Narita and transit passengers. A sister course of Caledonian and designed by J.Michael Poellot. Scotish style links in Japanese atomosphere. 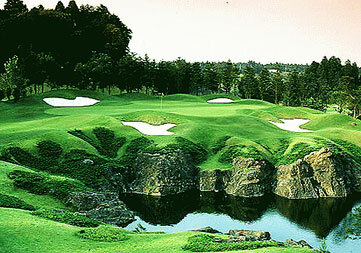 Significant and symbolical hole of this course is No.7th (above picture) par 3. There is a green on the rock and four big white bunkers surround it. A very beautiful and tough hole.